7-Day personalised 4WD tour. See the best that South Australia’s majestic Flinders Ranges has to offer. Fly around the Spectacular Northern Flinders Ranges geological formation called the Mawson Plateau. Too much to mention in a brief! 7-Day Personalised Four Wheel Drive Tour. See the best that South Australia's majestic Flinders Ranges has to offer. Fly around the Spectacular Northern Flinders Ranges geological formation called the Mawson Plateau. After dark you tour the universe from one of Australia's largest privately owned astronomical observatory. 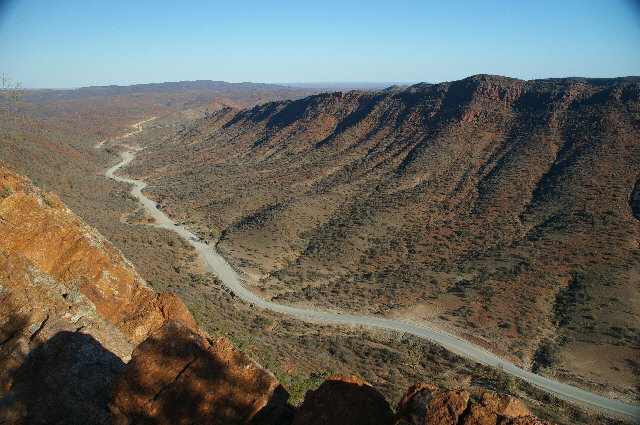 Enjoy the world famous Arkaroola Wilderness Sanctuary's Ridge top Tour. Travel through the deep gorges of the Arkaroola Sanctuary. View aboriginal petroglyphs at Chambers Gorge. Scenic flight over the unique land formation known as Wilpena Pound (Ikara) Walk into Wilpena Pound to Hills Homestead and Wangara Lookout. Tour the length of the Flinders Ranges, enjoy the Arkaroola Wilderness Sanctuary four hour 4WD Ridge Top Tour and 75 minute scenic flight over the Northern Flinders /Gammon Ranges including Lake Frome (salt lake). 30 minute scenic flight over Wilpena Pound. Tour Includes: Ridge top tour, scenic flights x2, Arkaroola Observatory tour, 3 nights Arkaroola Resort, 2 nights Wilpena resort, 1 night Prairie Hotel, Dinners are 3 course, Bed & Breakfast (continental and/or cooked) twin share, Morning teas, lunches. Single supplement applies ($90.00 per night). Adelaide CBD pick up and drop off. Day 1: 8.00am Adelaide pick up - Travel to Arkaroola Wilderness Sanctuary via Burra (morning tea) along the Broken Hill road to the lonely township of Yunta (lunch). From here our outback journey really begins as we leave the smooth tarmac roads behind us. For the next 300 km it's just us, dirt outback roads and the wildlife until we reach the civilisation of Arkaroola Village. After dinner we view our outer solar system of planets, binary stars and galaxies from Arkaroola's Observatory. Day 2: After a strong coffee and healthy breakfast we join the morning departure of the world famous "Ridge - top Tour" to witness the amazing views from the heights of Sillers Lookout whilst taking in the knowledgeable commentary from one of Arkaroola's Eco- Accredited guides. After lunch we explore the Southern tracks of the sanctuary including the historic Bolla Bollana Smelter and Waterhole, also the amazing Pinnacles which are an outstanding feature of the Mawson Valley and much more. Day 4: This morning we say good bye to our new friends at Arkaroola and take the whole day to sightsee our way through to Parachilna, we'll be taking in the sights such as the Historic Balcanoona Woolshed, Neppabunna Aboriginal community, Leigh Creek (coal mining township), Aroona Dam, the remains of the old Ghan railway township of Beltana, Coffee /tea and scones at Beltana Station (sheep), Parachilna Gorge arriving at the "Prairie" around 5 o'clock. Pre dinner sunset drinks watching the sun drop beyond the flat Western Plains. 3 course dinner... Deluxe ensuite room. Day 5: Depart for the abandoned Nuccaleena mine travelling via the picturesque Parachilna Gorge and historic Moolooloo Station, arriving at the old copper mining town of Blinman for lunch. Next we travel 70km to Mount Chambers Gorge, the most spectacular accessible gorge in the Flinders Ranges. 4WD trek into the gorge to witness River Red Gum surroundings and walk along the floor of Mt Chambers Creek to view the gallery of aboriginal rock engravings reputed to be thousands of years old and return to Wilpena Resort via the Bunkers Range within the Ikara-Flinders Ranges National Park. Day 7: We start the day with the first scheduled 30 minute scenic flight over Wilpena Pound to get the best flying conditions and best light. Return to the Resort for a leisurely breakfast. An easy 1 hour walk to Arkaroo Rock aboriginal art site then a leisurely drive to Adelaide via farming communities such as Orroroo and Jamestown stopping for a cafe lunch. Clare Valley is an ideal whistle stop for coffee and /or a wine tasting. Arrive in Adelaide approx 6.00  6.30pm.